As fast as we learn to swipe instead of type, or tap to pay, we’re already looking for a faster, shinier option — or complaining about why it doesn’t exist yet. Who could possibly can keep up with this unending demand for faster, more hassle-free customer experiences? Guess we shouldn’t be surprised that twice as many brands’ CX scores fell as rose in 2017. So we went looking for inspiration, seeking brands that have made big innovations in CX convenience and scored great business results. At the top of the leaderboard, we found a focus on customers as individuals, and on digital experiences that both collect customer data and use it to remove friction from life in a virtuous cycle. How many steps does it take to place a pizza order? Too many, Domino’s realized. Its response didn’t just create one new-and-improved way to order, but rather a multi-channel strategy that lets customers order “Everything you love, any way you’d like” with as little as one click. 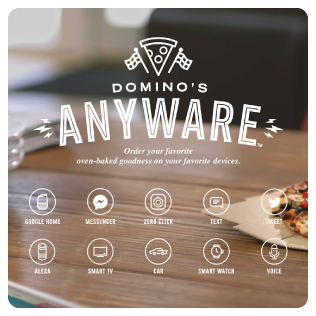 What’s the Big Idea:The Domino’s AnyWare platform lets customers choose whatever ordering method seems easiest to them at the moment, whether that’s to tweet, text, talk to your Ford, chat on Facebook Messenger, tap your smartwatch or tell your Amazon Echo. This allows Domino’s to introduce new ways of ordering as consumer tech preferences change. Just as important as the multi-channel customer interface is the seamless connection to Domino’s in-store systems: the intersection of customer-facing and staff-facing systems is a common cause of CX breakdowns. Why Customer Identity Matters: Domino’s digital loyalty program, launched in late 2015, enables the brand to engage with individual customers acrosschannels, serve them faster and personalize interactions based on their saved preferences and ordering history. How It Impacts the Bottom Line: Over 60% of Domino’s U.S. sales now come through its various digital channels. While the AnyWare platform requires ongoing investment, it reduces restaurant labor costs and increases order size vs. phone ordering thanks to compelling digital graphics and built-in upselling. The financial results speak for themselves: double-digit growth in sales and earnings per share in 2015 and 2016. Share price rose from $73 in August 2014 to $198 in August 2017, and Domino’s is on track to overtake Pizza Hut as the number one pizza restaurant in the U.S. this year. With big-ticket electronics, a lot of the hassle is in the research phase. Ever spent precious time researching options, only to delay the purchase so long that you forgot what your perfect final choice was? Best Buy has tackled this (and many other common shopping hassles) with a highly functional customer experience that integrates live/in-store, website and smartphone application capabilities. 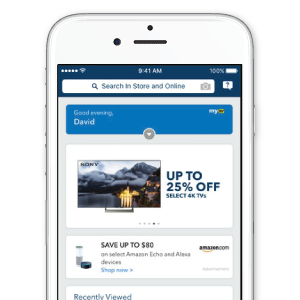 What’s the Big Idea: The My Best Buy loyalty program and app do more than just deliver rewards: they dramatically improve shopping convenience both online and in-store. For example, your MBB profile saves your online browsing history so you can easily look back — on any screen — and find that exact smartphone or learning thermostat that you liked. This saved profile also serves up conveniences like showing ready-to-redeem rewards right at the top of your screen, easy reordering of consumables like printer ink, in-store scanning of items to create a wish list, and options to customize email communications. Why Customer Identity Matters: Best Buy uses its loyalty data to deliver customer-level personalization. It’s most evident in its emails and on its website, where messages are customized based on past browsing and purchasing behavior. To achieve their goal of developing broader, stickier customer relationships, Best Buy recognizes the importance of connecting data streams at a customer level, despite the challenge posed by customers having multiple identifiers that vary across marketing, paid advertising, purchasing and service touchpoints. How It Impacts the Bottom Line: From 2013 through 2016, Best Buy’s transformation strategy, Renew Blue, stabilized a business threatened by both Amazon and Walmart. EPS rose 9% per year, while return on invested capital climbed from 11% to 19%. The chain’s Net Promoter Score increased by more than 350 basis points in 2016. In the travel industry, a lot of the customer hassle occurs on site at the traveler’s destination, so that’s where Hilton has focused its innovation. What’s the Big Idea: The Hilton HHonors app addresses several of the most annoying and time-consuming parts of a hotel stay via pre-arrival room selection, digital check-in, key-free room access and Uber ride hailing. 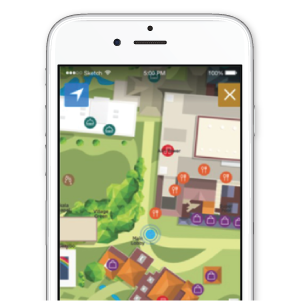 The app’s Fun Finder leverages Wi-Fi, beacon technology and GPS to personalize the guest experience, with support for wayfinding, app alerts about local activities and on-property upsell offers customized to the guest’s preferences and the time of day. Hilton plans to add two-way chat next year. Why Customer Identity Matters: Fun Finder enables Hilton to capture and mine more data on guest behavior, and also opens up new revenue streams. How It Impacts the Bottom Line: Hilton credits the HHonors app with helping to attract millions of new members to its loyalty program, which now numbers 67 million people who account for 57% of the chain’s occupancy. First-half 2017 results for Hilton Worldwide Holdings included a 12% increase in adjusted EBITDA versus prior year. Success Factors: What do all these three brands have in common? It goes well beyond the design and release of a mobile app. An app isn’t a guaranteed slot machine for revenue: it only pays off if enough of your customers adopt it and use it regularly. Rather, they share a commitment to making their brand the most convenient through a strategy of continuous technology advancement and innovation. These brands give consumers not just one but multiple ways to interact — and the freedom to choose their preferred mode. What’s Next: The very process of having to install an app is inherently inconvenient. Marketers are already looking at alternatives such as chatbots, which are powered by artificial intelligence engines and support natural-language interactions without the limitations of predefined menu options. Chatbots can be incorporated into a website or app, accessed through a text-based messenger platform (avoiding yet another app install) or run on a voice-based platform like Amazon Alexa. Progressive web apps, which run on the mobile web in any browser, are another alternative. And what if consumers don’t want to type, click or talk at all? Internet-of-things sensors, on-location beacons and in-store Wi-Fi are all ways to recognize a smartphone user and trigger delivery of a relevant offer. Final Thoughts: CMOs looking to win on customer experience and on convenience should review the modes of interaction they currently offer and where they have opportunities to add or improve, and also evaluate the emerging technologies noted here. Use these brands’ success stories as a springboard for your own convenience innovation. But remember: it’s the total customer experience that matters, and each mode of interaction must be integrated with the rest of the customer experience to succeed. What’s “So convenient!” today won’t be anything close to convenient tomorrow.